Meat Mincer BJRJ-22 - Hangzhou Expro Machinery Engineering Co.,Ltd. 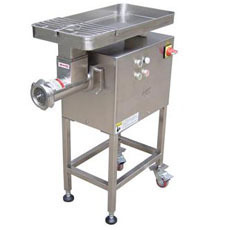 BJRJ-22 meat grinder can grind meat lumps and food into grains of various sizes. The special designed main shaft increases the discharging speed, and minimizes the temperature rise. Safety guards are installed on the discharge area and the top cover.